The Optikos advanced software measurement package is the heart of its electro-optical testing system. The I-SITE™ system is the most flexible test suite commercially available, testing discrete components through complete systems. The I-SITE™ system is designed to provide measurements at multiple points in the signal processing chain for many types of electro-optical systems. I-SITE™ software can be expanded to accommodate new measurements and can be upgraded to incorporate additional modules as the user’s system requirements change. 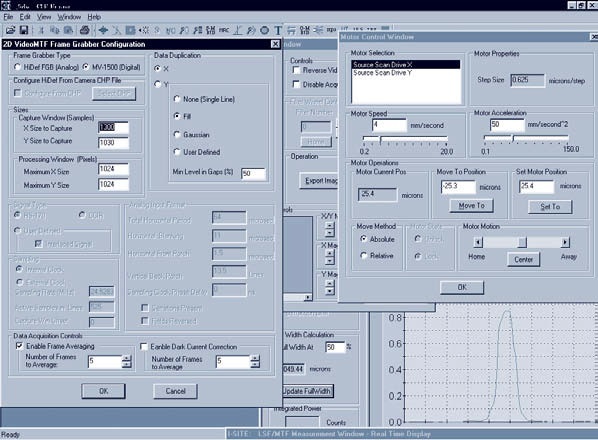 The I-SITE™ software package is designed specifically for connecting the Optikos source units, positioning equipment, and other measurement devices to Windows NT compatible systems. With appropriate hardware, I-SITE™ software can capture data directly from optical images or video signals to make a range of important measurements on almost any electrooptical system. 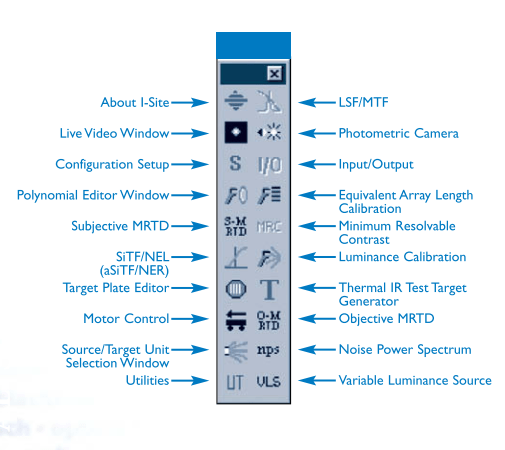 There are standard I-SITE™ configurations for testing thermal imagers, CCD cameras, displays, image intensifiers, and array detectors. Actual measurements performed depend upon the physical measurement device used. There are many options that may be employed; thus there is no single I-SITE™ setup. Sources, detectors, and intermediate optics may all be configured to your requirements, and several different analysis options are offered. I-SITE™ toolbar with easy access to I-SITE™ measurement functions. With 2D I-SITE™ MTF,4-bar MTF of a FLIR can be measured in real-time. 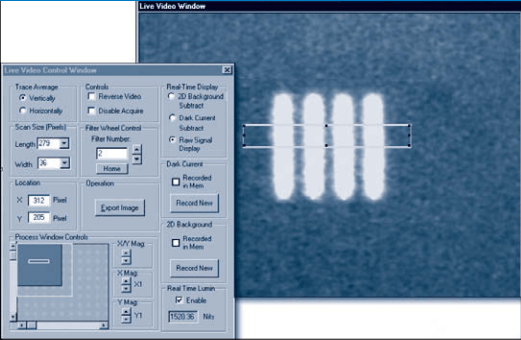 The multiple window interface allows several test parameters and results to be viewed simultaneously. 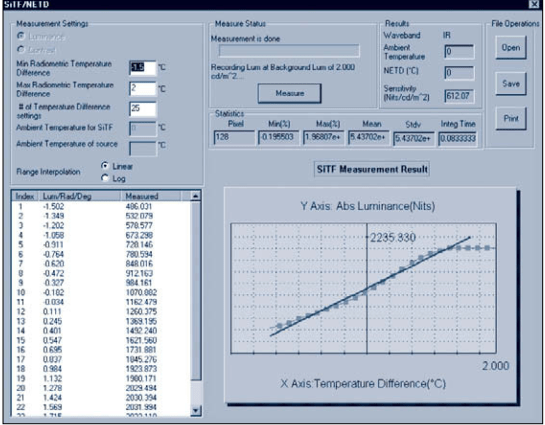 I-SITE™ software provides OLE interfaces for users to create optical testing macro programs. 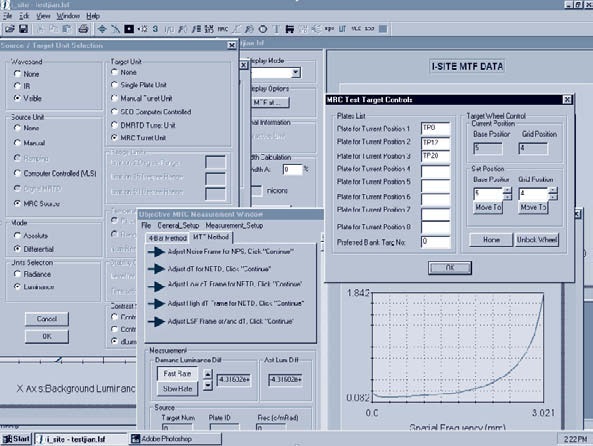 Third party industry standard tools, such as Microsoft® Visual Basic®, National Instruments LabVIEW and Sybase PowerBuilder can be used to access many I-SITE™ functions. Macro programs allow seamless integration with application programs such as Microsoft® Excel and Access®. The ability to create stand-alone programs is a standard feature of I-SITE™ software and samples are provided. Applications range from simple “go/no-go” macros, to more elaborate programs linking bar-coded lot information to MTF measurements. Access to I-SITE™ functions gives you unparalleled flexibility and power in building your quality control infrastructure. Objective MRTD can be measured using single-button operation. 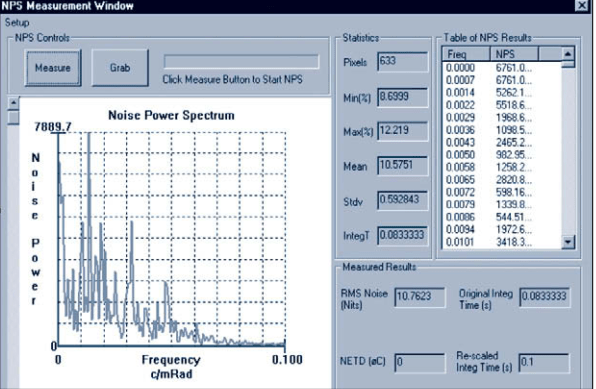 Components of MRTD, such as SiTF and NPS, can be separately analyzed to further evaluate system performance. 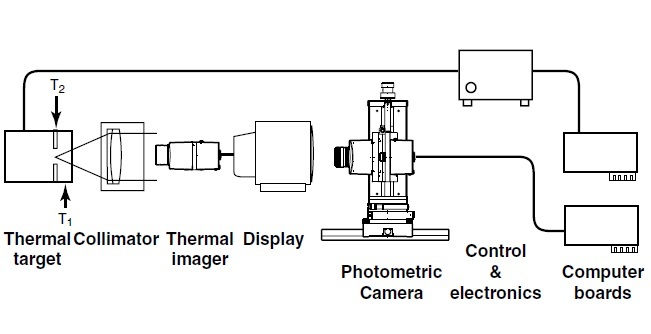 The Minimum Resolvable Temperature Difference (MRTD) of a thermal imager is, by definition, a subjective measure of its ability to resolve detail as a function of thermal contrast. Four bar targets of selected spatial frequencies are presented to the imager. An operator observes the targets and adjusts the temperature difference between the target and background until all four bars become visible against the background.MRTD has units of °C at a given spatial frequency (in cycles/mrad), combining both spatial and thermal resolution into a single quantity. This measurement is termed subjective MRTD. 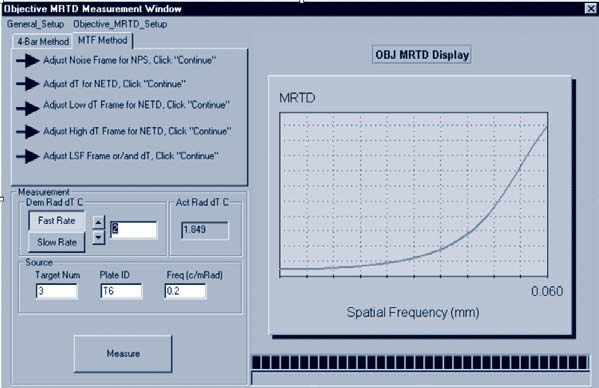 Unlike subjective MDTD,which relies on the observer’s perception of contrast, objective MRTD uses measurement devices for quantitative image acquisition and analysis.The Optikos I-SITE™ testing system incorporates two different methods for measuring Objective MRTD, namely the 4-bar method and the MTF Method.The 4-bar method is based on an adaptation of the traditional 4-bar subjective method of measuring MRTD. The MTF Method allows a more rapid objective MRTD measurement to be made. 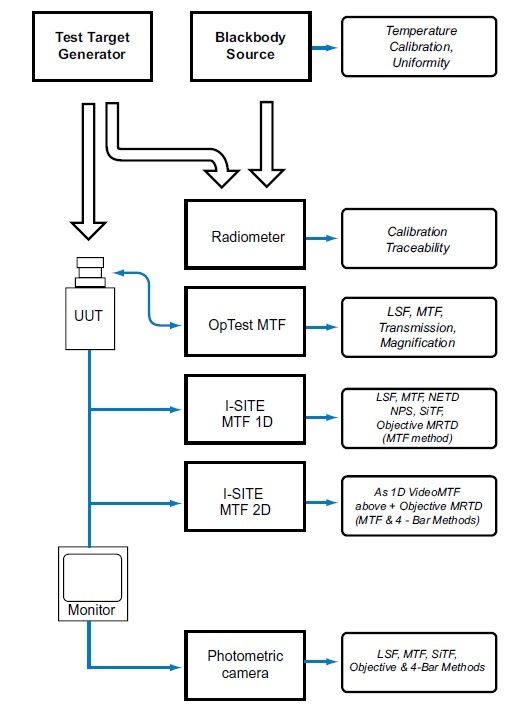 The 4-bar method uses two-dimensional data and can only be performed using a 2D measurement device.The MTF Method is one-dimensional and can be performed using any measurement device.Both methods include mathematical models for the human observer and require a subjective MRTD measurement/calibration to be made for each thermal imager design type.Once this calibration data is stored routine objective measurement can then be made. The 4-bar method is a direct measure of signal to noise ratio when the system under test views a 4-bar target (MRTD) or circular target (MDTD). measures RMS Noise in the image,and the contrast between bar/aperture regions and the background. Measurements are made at either two or four temperature differences per spatial frequency to determine the relationship between temperature difference and signal to noise ratio in the image. Objective MRTD/MDTD is then defined as the temperature difference at which the signal to noise ratio is equal to a preset threshold value. 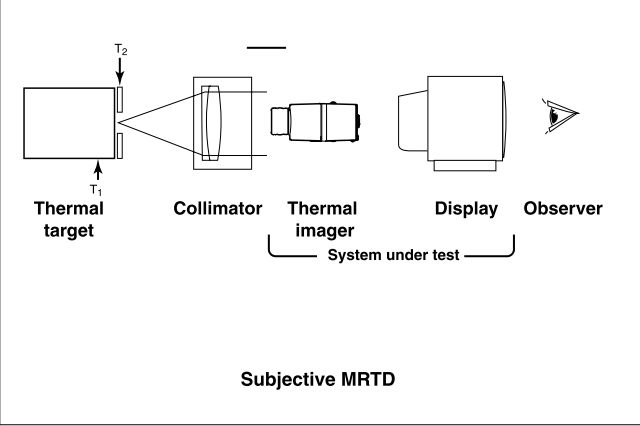 The MTF Method uses mathematical models of the human observer to give Objective MRTD and Objective MDTD.It is a relatively quick method, involving a single calculation only.This involves the measurement of MTF,NPS and NETD together with calibration parameters specific to the type of thermal imager under test.